Jiro Matsuda was born in Himeji, Japan in 1933. 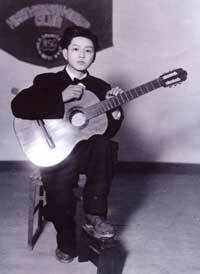 He started to play the guitar at the age of 14, seeking guidance throughout Japan when and where he could find it. 1957 graduated at Kobe Univ., faculty of Economics. Awarded Music Prize for Young guitarist, given by a monthly magazine "Guitar Friend"
Andrés Segovia commended his playing, and in 1960 he traveled to Europe where for two years he studied with Segovia and Alirio Diaz in Siena, Italy, and in Santiago de Compostela Spain. During this time he also studied with Mr. John Williams in London recommended by Mr. Segovia. 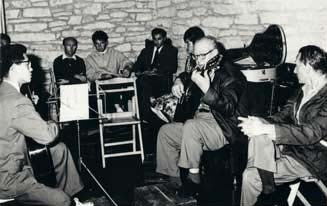 1961 Awarded Papas-Puyana Prize at the International Guitar Competition in Spain, under auspices of Andrés Segovia, sponsored by the Conservatory of Music at Orense, Spain. 1962 Many concerts in the U.S. and appearances on TV and radio broadcasts. 1963 Received the Japan Critic Club Prize of the year. 1964 He was invited again to the U.S. to give concerts. Made debut appearances in Hong Kong and Singapore. 1969 Made debut concerts in Carnegie Recital Hall in New York and in Wigmore Hall in London with great success. 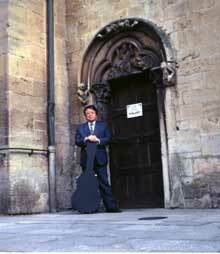 Although Jiro Matsuda numbers such potent guitar personalties as Andres Segovia, Alirio Diaz and John Williams among his mentors, he is nonetheless very much his own man. This classical guitarist from Japan is an articulate individualist, as his program last night in Carnegie Recital Hall demonstrated. 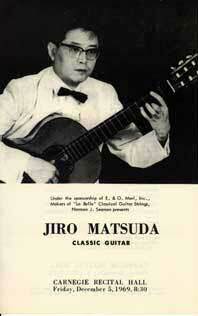 Even granting the reticent nature of his instrument, Mr. Matsuda's performances were on an extremely intimate scale. In fact, during much of De Vis仔's Suite in D minor and Bach's Third Suite (originally for cello), he seemed to be playing for himself. Yet within his rather rarefied sphere of reference, Mr. Matsuda commands extraordinary subtle gradations on tonal coloring. The Bach especially was shaded with a melting delicacy that ingeniously pointed up the structural clarity and rhythmic design of each movement. For a collection of genre pieces by Rodrigo, Villa-Lobos, Torroba and Castelnuovo-Tedesco, Mr. Matsuda broadened his introspective approach somewhat. Here, too, his playing was a model of taste and refinement. "AT LAST we have a guitarist in Japan." Segovia was referring to Jiro Matsuda who was at Wigmore Hall last night, and who brought with him from Japan a typical Segovia programme, ranging from sixteenth-century pavanes and Bach transcriptions to Ponce,Tansman, Castelnuovo-Tedesco, names as well known to guitarists and their audiences as those of Reubke and Rheinberger are to the organists. In these mysterious closed worlds, to know how to write for the instrument is just as important as to know what to write. These specialist composers often seem to take no notice of what is going on in the outside world. The last work in the programme, by E. Djemil, prizewinner in a Paris guitar competition in 1968, was in the gentlest neo-classical style, nearer to Grieg than Prokofiev. Still one goes to guitar recitals to hear the instrument and the player, and interest in the compositions in this case takes third place. 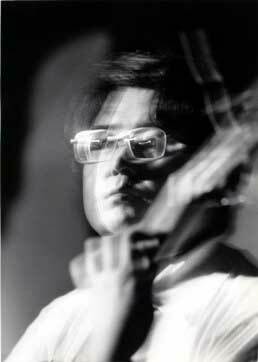 Jiro Matsuda is a technically excellent guitarist, his Bach transcriptions were played with extraordinary fluency and smoothness (one of the strange things about guitars is that one knows that the things that sound easiest are often terribly difficult, while the most brilliant passages may be Grade 1 material). The Ponce Third Sonata takes itself rather seriously as music; but like one of Henry Irving's great, but second-rate roles gives the player every chance to display subtleties of inflexion and a great range of rhetorical effects. It also makes imaginative use of the different characters of bass and treble registers; on what other instrument can changes of timbre be so tellingly exploited? 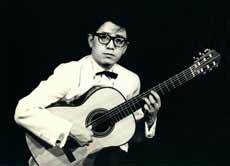 Up to this point, Jiro Matsuda had struck me as more of a technician than a poet, but his playing of the later Spanish or Spanish-style pieces was free, expressive and entirely idiomatic. As usual, it was the pieces with fewest pretentions to seriousness that gave most delight both to me and to the rest of the audience. The pretty, sad, Caprice, Complainte et Ronde, which won the Paris prize was agreeable to hear once, but I doubt if it will stay in the repertoire with Bach, Ponce, Tansman, and the rest. 1973 Undertook a concert tour in England and performed also in Paris and Dublin. Made a recording for Argo Decca, London. Invited as a solo player in Bergen Music Festival, Norway. 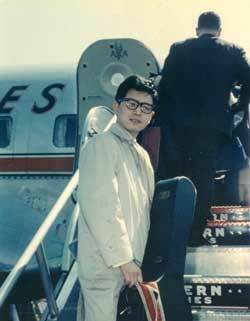 1974 Attended the Hong Kong Arts Festival as a solo Guitarist. 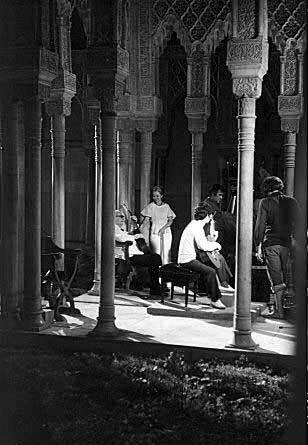 1976 Invited as stand in for Maestro Andrés Segovia during the making of Christopher Nupen's famous film Andrés Segovia: The Song of the Guitar, shot in the Palaces of the Alhambra in Granada, Spain. 1979 Became an Honorary Board of Directors of International Castelnuovo-Tedesco Society. 1982 Appeared as presenter in NHK television series "Let's play guitar" (NHK is the national broadcasting network of Japan). 1985 Gave world premiere of several pieces from "Capriccios de Goya" by Mario Castelnuovo-Tedesco. Bestowed an award of Cultural Services from his native city Himeji. 1989 He was charged as a jury for the 1st Andrés Segovia International Competition held at El Escorial, Spain. 1990 Gave financial support to a project for the protection of wild birds, giving a charity concert entitled "Save the Bird Concert". 1992 Issued "Sound of the Guitar 2". 1995 Played "Platero and I" by Mario Castelnuovo-Tedesco based on poems by the Spanish Poet Juan Ramon Jimenez, to accompany a shadow picture show by Japan's leading exponent of the art, Seiji Hujisiro. 1996 A concert tour in Germany, in June to July. 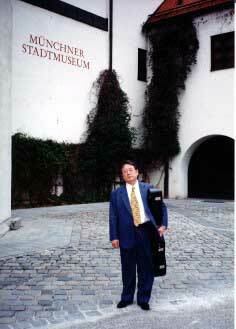 2001 My essay "Guitar is an Orchestra of a Small Planetﾓ was published.